Welcome to my extant gowns and outfits blog. Please, feel free to comment below and tell me a bit about how you found this blog and what your favorite era is. Thank you! 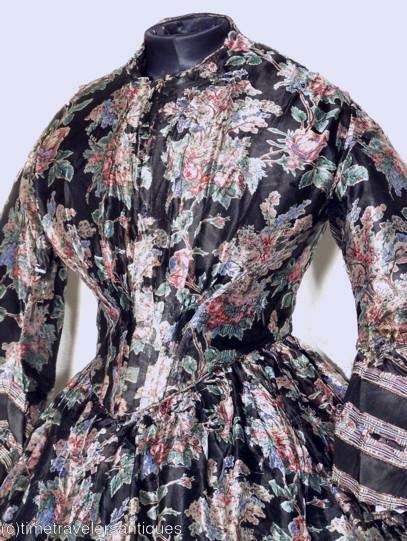 A whispy original circa 1864 lady's one piece sheer printed voile gown in a beautiful floral design on a black ground. A lovely fan pleated lined bodice, piped at the neckline and at the drop armscyes to the modified pagoda sleeves that are trimmed in fancy silk ribbon bands. 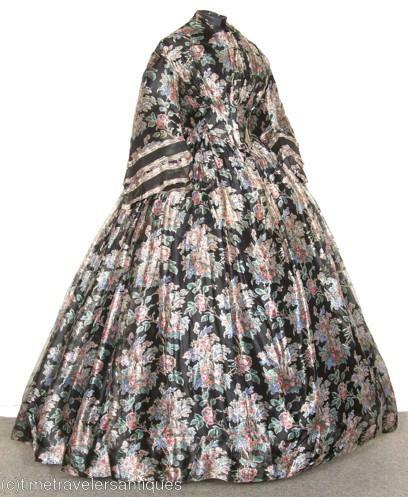 A sheer unlined skirt is shown here (over a hoop skirt that is not included). A cartridge pleated waistband and a deep turned hem. The bodice has a hook and eye lining only closure to the front, and the skirt has a side of front hook and eye closure. 17" from shoulder to shoulder, a 36" bust, 28" waist, and 55" from shoulder to front hem. 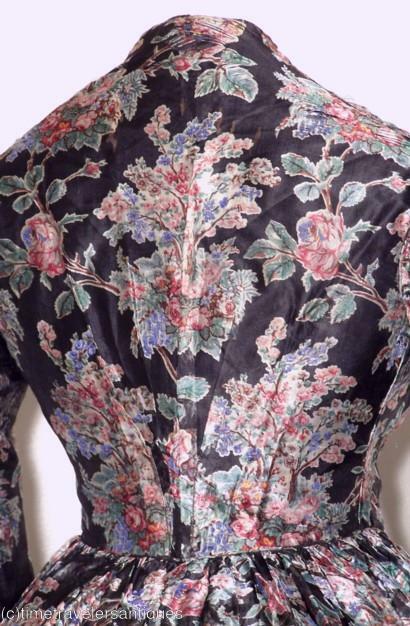 Offered for study, in as found condition, with strong color, fray and some surface holes at the stress points of the bodice that include the top of shoulder seams, the back of the neckline, armscyes, inner sides of the sleeves, and at the creases of the elbows. The skirt has several mends and small openings. 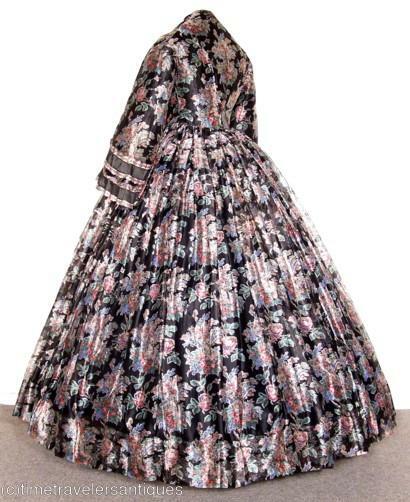 All is reflected in the reserve price for this striking original Civil War era gown that still makes a wonderful presentation. All I can say is that I swear this dress looks like it was made out of some 1980's curtains until you see the details.